The name "Polar Star"seems to reflect the rare purity and luster of this 40-carat brilliant-cut diamond, which is more reminiscent of its celestial counterpart in the northern skies. The "Polar Star"diamond is a 40-carat, round brilliant-cut, colorless stone of unknown color and clarity grades. But, going by the description of the diamond, it must have been a D-color diamond, with an internally flawless clarity grade. If the diamond is an absolutely colorless diamond it must be a Type IIa diamond, a rare group of diamonds that are said to be the "purest of the pure"of all diamonds. They constitute only about 1-2 % of all naturally occurring diamonds. These diamonds are chemically pure and structurally perfect. The absence of impurities such as nitrogen, boron and hydrogen makes the diamond chemically pure, and absolutely colorless. It is the impurities that impart color to the diamonds. The crystals are also perfectly formed, without any plastic distortions. Structural distortions in the diamond can also impart rare fancy colors to diamonds by changing the absorption spectrum of the diamond. Thus being chemically pure and structurally perfect these diamonds are absolutely colorless. The earliest record of the existence of the polar star diamond was with Joseph Bonaparte, elder brother to Emperor Napoleon Bonaparte of France, who was successively king of Naples (1806-08) and king of Spain (1808-1813). Joseph Bonaparte was also a keen collector of jewels and is reported to have purchased the "Polar Star"diamond from Morton for 52,500 francs. After the surrender of Napoleon in 1815 at Rochefort, Joseph Bonaparte settled in the United States. He might have disposed of his jewels during these turbulent times, and this probably would have included the "Polar Star"diamond. 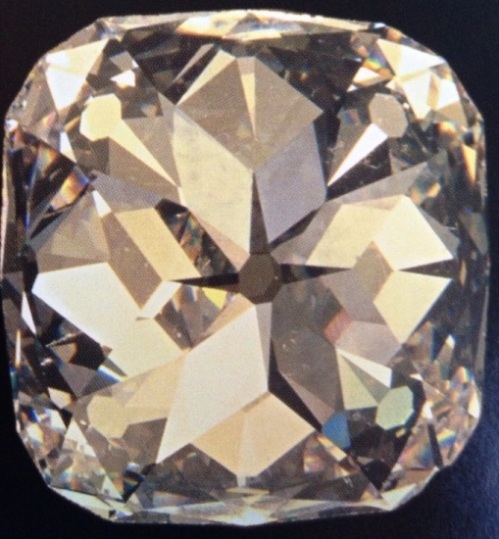 The diamond next seems to have made its appearance in London, where it was purchased by the agents of the Russian Imperial family, and the Polar Star thus became an important part of the Russian Crown Jewels, which also included the "Orlov"diamond, the "Moon of Mountains"diamond and the "Shah"diamond. According to an alternative version the "Polar Star"diamond was purchased by Princess Tatiana Youssoupov (1769-1841), wife of Prince Nikolai Borisovich Youssoupov, who was a Senator, Minister of State Properties and Director of Imperial Theatres. He was also a keen traveler who spoke five languages and a patron of the arts. Nikolai served under three sovereigns, including Catherine the Great, Paul I and Alexander I, as a private councilor and diplomat. In his travels through Europe he met sovereigns of France, Prussia and Austria. He had also met Napoleon I on several occasions. In 1973, Prince Nikolai Borisovich Youssoupov married Tatiana Vasillieva. The couple lived in the luxurious palace of Arkhangelskoye in Moscow. Princess Tatiana Youssoupov was the niece of Potemkin, the favorite of Catherine II, and had a passionate taste for jewelry. She started a jewelry collection which soon became famous. She bought the Polar Star diamond and several parures which came from the French Crown, and from the Queen of Naples. She also purchased the La Pelegrina pearl, which once belonged to King Philip IV of Spain. The "Polar Star"diamond remained in the Youssoupov family until the beginning of the Russian Revolution in 1917. The diamond was finally inherited by Prince Felix Youssoupov II, son of Princess Zinaida Yousoupova (1861-1939) and Count Felix Sumarokov (1856-1928). Prince Felix Youssoupov II was exiled to the Crimea, after being found guilty of the murder of Rasputin the mad monk, just before the Bolshevik Revolution of 1917. Prince Felix Youssoupov returned to St. Petersburg in 1917, and found the city in massive disorder after the February revolution. He took with him some of his most precious paintings, and the jewelry and in August of 1917 left Russia for good to Paris. Among the jewelry he carried with him was a collection of expensive pearl jewelry which included the La Pelegrina, the "Polar Star"diamond, the "Sultan of Morocco"diamond, the "Ram's Head"diamond, and a pair of diamond ear-pendants that belonged to Marie Antoinette who was guillotined to death during the French Revolution. Prince Felix sold most of the jewelry to Cartier's. The Polar Star and the Sultan of Morocco was disposed of somewhere between 1922 and 1925. The Pearls were also purchased by Cartier's in 1934, except the La Pelegrina pearl which he could not bear to part with. He sold the La Pelegrina pearl only in 1953 to Jean Lombard, the Geneva based jeweler, with close connections to the Russian Nobility.